Painting size:12x12inchx4 (30x30cmx4).Each canvas art size can be personalized made.If you prefer your own photos/pictures print on canvas,please contact us directly. Beautiful seascape landscape canvas wall art inkjet printing.Environmentally friendly non-toxic odorless imported ink,waterproof moisture-proof UV!Actual wall art canvas might be slightly difference in color, because of the different computer monitor settings. Sea sunset canvas paintings stretched and framed by environmental protection real wood,will never deformation.Metal hooks and Invisible nails will be sent with painting.Pure hand mounting.Paintings are Packed in Carton Box.Edges are also painted to insure the perfect artistic effect.Each panel is wrapped by plastic bag to stay away from contamination. Both internal and external packaging are strictly required to ensure the multiple protection of transport. 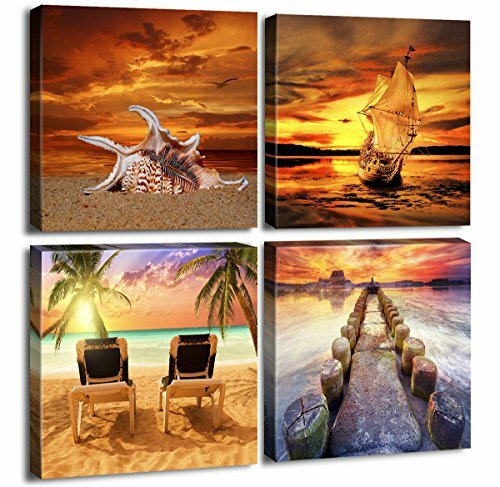 Beach conch canvas wall art paintings are shipped by Amazon from US.Gallery wrapped and stretched with wooden frame on the back.Your satisfaction is 100% guaranteed! We supports 30 days no reason to return, damaged free delivery, shopping zero risk.Once your prints arrives,if you have any questions, please Email us at first time! Perfect choice for wall art decor such as business,home, office, kitchen,dining room,bathroom,hotel,bar and bedroom,living room,bathroom,children room,study room, new house,bridal chamber and so on.A great special gifts for your relatives and friends.To enhance your home ambiance and impress your guests. PIXEL POWER shop all the products are original design, we have not authorized to any company or organization and individuals can use this picture's copyright. If you have any questions about this product by PIXEL POWER, contact us by completing and submitting the form below. If you are looking for a specif part number, please include it with your message.